Relief from a chesty cough can be simple when you’re on the go – just add Prospan Drops. Prospan Drops provide handy, on-the-go relief for chesty coughs, and are backed by rigorous clinical evidence.1,2 Take the drops with water or other drinks – it’s up to you. The non-drowsy, sugar-free formulation has been used for decades worldwide. This product may not be right for you. Read the warnings before purchase. These can be found in the dosage section below. Follow the directions for use. If symptoms persist, talk to your health professional. 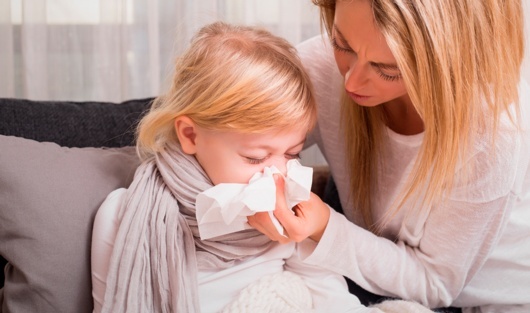 Food for thought: Did you know that on average, Aussies can catch 2-4 colds every year? When a cold leads to a chesty cough, you can find relief with Prospan drops which contains the specific Ivy leaf extract known as EA 575. Prospan Drops is not recommended in children under 12 years of age. Do not use if pregnant, likely to become pregnant or breastfeeding. Shake the bottle well each time before use as there may be cloudiness and/or dark suspended particles due to the natural origin of the herbal extract. Use the enclosed dropper and mix with a small amount of water or cold liquid according to taste. The tolerability of Prospan’s exclusive EA 575 Ivy leaf extract is based on research in thousands of patients and decades of use worldwide. There are no known reported interactions between Prospan Drops and other medicines. It is recommended to talk to your healthcare professional if you have any questions about using Prospan Drops. Contains ethanol. Contains saccharin sodium. Always read the label. Follow the directions for use. If symptoms or coughing persist, talk to your health professional. That’s why a patented production process is used to make Prospan. It’s the result of 65 years of research and innovation, and it helps ensure that every batch of Prospan has the same reliable EA 575 formula that’s been shown to relieve chesty coughs. Which Prospan product is best for me? Prospan is available in different formats to suit your individual needs: the original Prospan liquid, a great-tasting formula that’s suitable for the whole family; Prospan Menthol, suitable for adults and children over 6 years, with a fresh menthol taste; Prospan soft lozenges, suitable for adults and children over 6 years, and handy when you’re on the go; Prospan for Children, a great-tasting formula that makes it easy for children of all ages* to take, and Prospan Drops, suitable for adults and children over 12 years, and easy to add to small amounts of water and other drinks. Learn more about the benefits and dosage recommendations for each by clicking on their names above. *Not to be used not be given to children under 2 years of age without medical advice. Can Prospan Drops be used during pregnancy or breastfeeding? Do not use Prospan Drops during pregnancy, or if likely to become pregnant, or breastfeeding. Please see your healthcare professional for further advice. Are Prospan Drops likely to interact with any other medicine? There are no known reported interactions between Prospan Drops and other medicines. As always it is recommended to talk to your healthcare professional if you have any questions about using Prospan Drops. Can I give Prospan Drops to children? Prospan Drops are suitable for adolescents aged 12 years and over. Prospan Drops are not recommended for children under 12 years of age. For children under 12 years, you can use Prospan for Children or Prospan. See packaging for appropriate children’s dosing. Prospan for Children and Prospan and should not be given to children under 2 years of age without medical advice. Do Prospan Drops contain gluten, dairy, colours or sugar? As a natural remedy for chesty coughs, Prospan Drops do not contain any added gluten, soy, dairy, sugar or artificial colours. Are Prospan Drops suitable for vegetarians? Prospan Drops are vegetarian friendly as they contain no animal derived ingredients. Do Prospan Drops contain alcohol? Prospan Drops contain 47% alcohol (ethanol). The total daily dose of Prospan Drops (72 drops) contains approximately 0.18mL of alcohol. Will Prospan Drops affect the ability to drive and operate machinery? 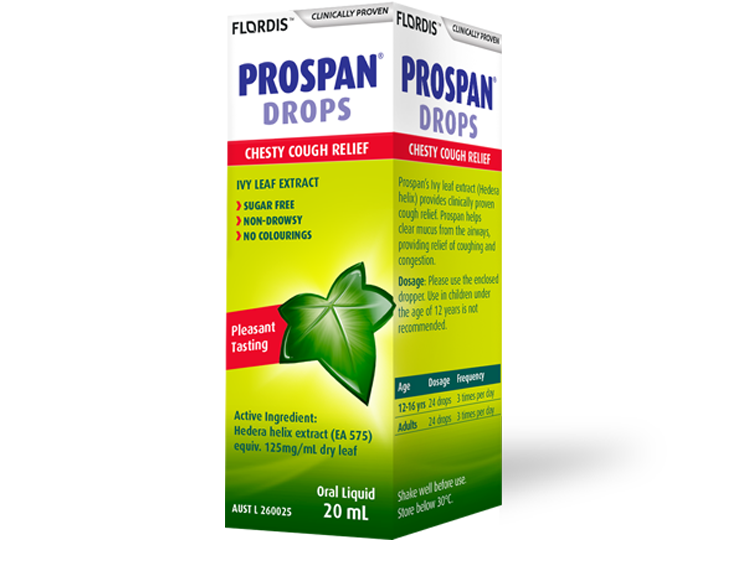 As a natural cough medicine, Prospan Drops do not cause drowsiness and are not expected to affect your ability to drive a motor vehicle or operate heavy machinery. The Prospan Drops liquid appears slightly separated or cloudy? Due to the natural origin of the herbal extract in Prospan Drops, cloudiness and/or dark suspended particles may occasionally form in the liquid and the taste of the preparation may also vary slightly. However, none of these instances affect the quality of the product. Where can I find Prospan Drops? The Prospan range is available from pharmacies and selected health food stores. If you go to the ‘Find a Store’ button above and follow the instructions, you will be able to find a list of stores in your area that either stock Prospan Drops or will know how to order them in. Lang C, et al., Planta Med 2015;81:968-974. Supported by Engelhard Arzneimittel GmbH & Co. KG. Schaefer A, et al., Pharmazie 2016;71(9):504-509. Supported by Engelhard Arzneimittel GmbH & Co. KG. Fazio S, et al., Phytomedicine 2009;16.1:17-24. Runkel F, et al., Pharmazeutische Zeitung 2005;15.04:19-25. Schlenger R. Deutsche Apotheker Zeitung 2003;143(49) [translation]. IMS MIDAS data, Absatz MAT12/2017. Prospan® are registered trademarks of Englehard.